Sermon, Pentecost 17C, Sunday September 15, 2013. I remember a particular event when I was about 4 years of age. It was a day in which I got lost. Mum, her sister and my two sisters and I went to the large department store close to our home. I didn’t mind going to the big shops. It was a world of people, colour, noise and that sense that the world is big and mysterious and there to explore. But what I did object to was which department my mum, aunty and sisters went to that day. It was the haberdashery department – material, buttons, reels of cotton and etc, etc. BORING!! For them it wasn’t. They made their own dresses because they couldn’t afford to buy a new dress. This was the clothes shopping day for mum and her sister. But to me it was just mind numbingly boring. Truth be told, this boy who is now a lot older than 4 still finds this whole department boring. Put me in Junkens or any other shop that is full of power tools, car parts or music or electronic goods and I am happy. Somehow, in my boredom, tinted with a little bit of rebellion and naughtiness, I just got distracted and drifted across the aisle into another department. As a four year old, time is not measured. I must have been in there for a while. As I was lost in my little exploration world, Mum and the others had moved on to yet another section of clothes and all that girly stuff…..
At first I remember feeling quite bold and courageous. “Look at me. I don’t need to go with Mum. I can go it alone and have more fun that way. I have got it covered. I can find some interesting things and enjoy what I find….”. I remember when the boldness gave way to that feeling of dread when I realised that I was alone in the crowd. In all the stands of goods and counters and signs and people etc, I could not see Mum or my aunty or even my sisters. I was lost in the big wide world. I was immediately scared. It was not being separated from my family that was the real fear, it was the sense that the situation was beyond me. I was without hope of finding them because I did not know what to do. I intuitively knew that I could not fix this problem. I was at the mercy of the department store gods and complete strangers. That’s the fear of being lost. In the same way, being lost to God is not only bad because we can’t know him and benefit from being in his gracious presence, it also must be bad for him because he sets himself the goal of finding us. being lost to God is also scary because we know the hopelessness of our lostness. Moments in life happen when we just know that we cannot get ourselves out of this one. This is of course a great dent in our pride. We do have this ability to convince ourselves that we really are invincible; that we really will have more fun if we just explore a little in our own direction; that we really will have a happier life if we do these things our way, aim for that self determined goal. We may even convinced ourselves that we can and should determine how we worship the Lord with our lives – how we be “good” people in God’s eyes so that all will go well with us in life….. This approach to our life is somewhere near the way of the Pharisees to whom Jesus squarely addresses these three parables in chapter 15 of Luke’s gospel: Lost sheep, lost coin and lost sons. So, there are two groups of people around Jesus, the tax collectors and sinners and the Pharisees and Law teachers. The ruthless and treacherous tax collectors and the isolated, sometimes brazen, often marginalised sinners respond to Jesus differently than do the keepers of the religious and social rules. Tax collectors and sinners are in the other department across the aisle with me when I was four – at first bold and rebellious and justifying their deeds in search of better things, more experiences, self-discovery and goods and services that bring pleasure and sense of well-being – until they realise that they are alone, very alone, disconnected and worst of all, impotent in the face of life’s challenges. They discover that they are unable to fix their troubled inner world, some of their relationships the consequences of bad decisions they have made or others have made that affect them. They are at their end. They are outside the group, disconnected from their home, their community, and they know it. They know they are lost. So when Jesus says God is active and searching for them, not in judgement and harsh words (like everyone else around them) but to find them because he names them as precious, like the woman sweeping under the couch for that lost coin or that farmer heading out into the open country to find that lost sheep; to welcome them back and stand with them and a legion of angelic choirs singing in joy, they like what they hear. They respond with relief and sense the joy and the new hope in Jesus. It is not that Jesus is eating with sinners and dining with traitors that challenges their world view, it is that Jesus is saying he is God doing this. Jesus is saying that God is dining with the outsiders, unacceptable, rebellious, unclean, untidy, untoward “un-Christian” people. If this is true, then the party of the self-righteous is fake. They are feasting at the wrong table in the wrong room. They are feasting at their own table of the self-righteous and self-confident. They have set up another table in the other department and don’t even know that they have lost touch with their Creator, their Saviour, their Wisdom and Guide. They are so lost that they don’t know they are lost. They are not scared of where they are but bold and brazen in their self-justification. Surely Jesus is puncturing their fake joy and security in themselves and declaring to them they are in the wrong aisle. He is saying to them that they believe themselves to found above all others, but they are actually lost among others; and Jesus does this not out of spite, but out of love for even these self-righteous! So, who are you and where are you today? Lost? Found? Fearful and at your end? Unaware that you are out of touch with your Heavenly Father’s grace and love – until now? Prideful and self-righteous or wounded and crumbling? Lost in self-loathing and doubting God’s good heart or jumping for joy because you know you are lost but that you have been found? Friends, whoever you are and wherever your heart is, these little words of Jesus are not about which group you belong to but where your heart is. At issue here are two different types of responses to Jesus and God’s presence. Sinners repent because they know they are lost and thus can avail themselves of the transformation that comes with God’s finding them. By contrast, the righteous do not need to repent (turn around) presumably because they don’t think they are lost. They don’t need God to find them; they are justified either in their own eyes or in the eyes of others (16:15; cf. 10:29; 18:14). Will you be found by a searching God this morning? Would you gratefully join in the festivities of heaven, the choir of angels singing in joy at you and your being found by grace? You can. We can. We will. We are the community of lost who have been found and being found by God’s grace is changing us to be people who seek the lost with Him. We are free to dine with sinners and spend time with the treacherous. We are called to speak with the self-righteous and those searching for life in the shadows of death. Lord, thank you for searching for us, finding us, throwing a party of angelic singing over us. Make us a community that revels in searching for the lost and celebrating the love and hope of Jesus. Luke 15 is the chapter of the lost and found. It contains three parables in a row about things and people being lost and found. We hear the parable of the lost sheep, the lost coin and of course, the lost sons. All three have some similar elements. The owner searches long and hard and in with some risk involved for that lost thing. 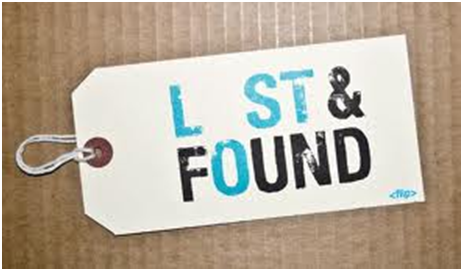 When the owner finds the lost thing, he/she gathers people around to celebrate the joy of that something or someone being lost now found. Share a story from your own experience of losing something and then finding it and describe the feelings attached to that find. Share a story of you or someone else being lost and describe that feeling as well as those feelings attached to being found. These parables are directly aimed at a particular group of people: read verse 1 and 2. What are they “mumbling” about this specific action of Jesus in “eating with sinners” do you think? It may be because Jesus is showing the God is concerned about and focussed on people other than them. It could be that they know that f God really is seeking the lost not to condemne them but to save them, then their strict lifestyle and world view of eating, living, worshipping and understanding will be severely challenged. It may be that they are very self-important. They are the 99 who deserve God’s undivided attention and so they have little time for the one lost sheep. Maybe all of these reasons are true. Do you think we at St Petri struggle with these attitudes in any way. Share your thoughts….. I notice an interesting reversal here. Some people think they are found by God but are actually lost. Others think they are lost to God but are actually found. Share your thoughts on this tricky reversal Jesus speaks of in these parables and how this applies to you and your faith. In the end I said I saw that these parables are meant to get to the truth that our response to God’s grace in Jesus is a matter of the heart…. As we acknowledge that we are more lost than we think and that the Lord is more gracious than we believed repentance becomes a possibility. Notice here that the meaning of “repentance” has little to do with feeling sorry for wrongs done or even our sinful heart. Rather the original word is “metanoia” which really means simply “turning around”. So here, repentance is about simply changing direction, turning back to the Lord with faith and joy in his grace and forgiveness. Does this differ from you view of “repentance”? So, repentance does not about feeling or showing great sorrow for sin as much as about trusting in God’s grace. Yes, we are “poor miserable sinners” but we are also dearly loved and valued people of God! How do we do this as individuals, in our smaller groups and as a local church?